Our sole guest today was Roseville Rotarian Marv Sorvala. President Cindy Carlson reported that the Board has approved donations to the Mounds View Police Foundation’s Daddy-Daughter Dance and to the Arden Hills/Shoreview Rotary’s Sewing School Project in India. Ed James said that our exchange student, Maria, has moved to Paul and Denise Jacobsen’s home. Please give the Jacobsen’s a call to schedule some time with Maria. Maria will be traveling to Hawaii from February 26-March 8th. - Marv Sorvala is engaged to Diane! - Bob Barmore is happy that the snowblower he bought five years ago at at Beisswenger’s started on the first pull yesterday. - Nicole and Tyson Ulrich sold their home and are looking for a new one. New member Charlie Longbella took the podium to deliver his new-member classification talk. Charlie was born in Minneapolis but moved to Chippewa Falls, WI when he was 5. He got his degrees in Business Administration and Golf Course Management from Stout and had a variety of jobs until he came to work for his uncle at Big Blue Boxes. Big Blue Boxes provides moving and storage services for homeowners and businesses. They rent shipping containers for storage at your home or business or at Big Blue Box’s secure storage area. They have over 1,000 containers available. The company has recently expanded its services to include intermodal trucking (transportation of shipping containers between trains and businesses. 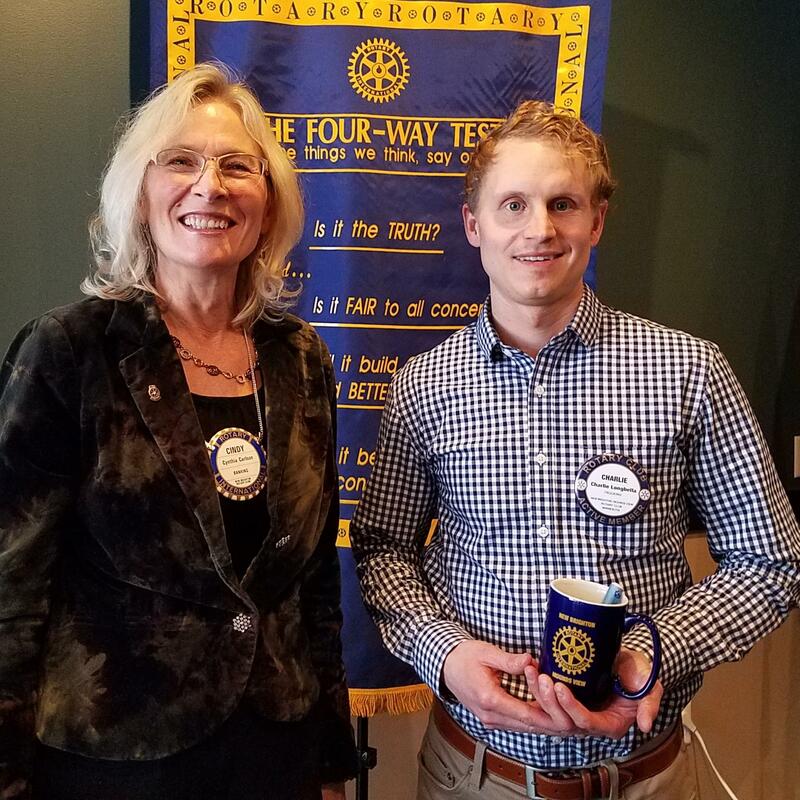 Charlie’s uncle, a Brooklyn Park Rotarian, encouraged Charlie to become involved in Rotary and, even before he joined our club, he was part of a Brooklyn Park Rotary project to donate a shipping container loaded with sewing machines, fabrics and other much needed supplies to Haiti. Charlie is jumping right in here at NBMV Rotary by agreeing to be on the board as director of Public Image/Communications. Charlie lives in Woodbury with his wife Molly and kids, Crosby and Hadley. Cindy and Charlie are shown below. - Service Projects, including Harvest Pack, Camp Enterprise, Food Shelf, Camp RYLA, CSC, Financial Literacy, Homelessness Eradication, Stockyard Days Parade, MV Festival in the Park, CPY, FMSC, Egg Hunt, among others. Club Administration Director Bob Barmore reminded us to attempt to get a variety of speakers and to make prospective speakers aware of our desire to avoid extremely controversial or offensive presentation topics.